This year marks the 40th anniversary of Warrant Officer Ellen Ripley battling a xenomorph in the sci-fi classic Alien. Reebok, which designed the super-high tops she wore in the sequel, is once again stepping up to celebrate the franchise with a special-edition pair of Alien Stomper shoes. They’ll be released Friday — April 26 aka Alien Day aka the annual event started by 20th Century Fox to celebrate all things Alien. Reebok’s previous versions were inspired by Ripley’s iconic shoes for actress Sigourney Weaver in Aliens and by the yellow and black Power Loader that she used to fight another xenomorph. The 2019 edition of the shoes is meant to look like a prototype that came before the original pair. The Alien Stomper 40th Anniversary OG mid-top shoes aren’t as dramatic as the super-high tops, but they’re more practical for everyday wear when you’re not fighting for your life on a spaceship. These are an updated version of mids Reebok released in 2015. 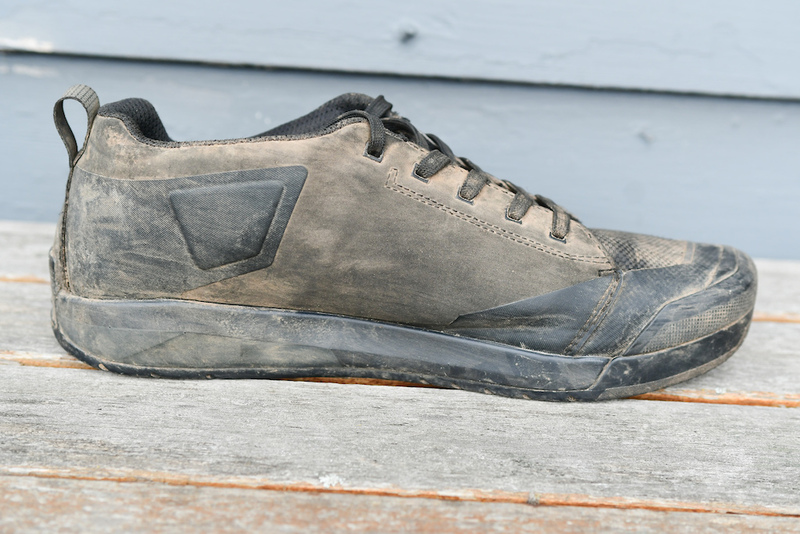 “When you buy it, it’s supposed to feel like you just happen to find this prototype of the shoe 40 years later that was on the ship, that’s why it’s aged and yellowed,” said Reebok footwear designer Chris Hill. Hill combed through original and concept artwork to feed into the details on the kicks. There’s even an early take on the Weylan-Yutani (without the “d”) logo inside the ankle. The new Alien Stompers come with a Stomping Guide that will hopefully help you survive your next space tug crew assignment. 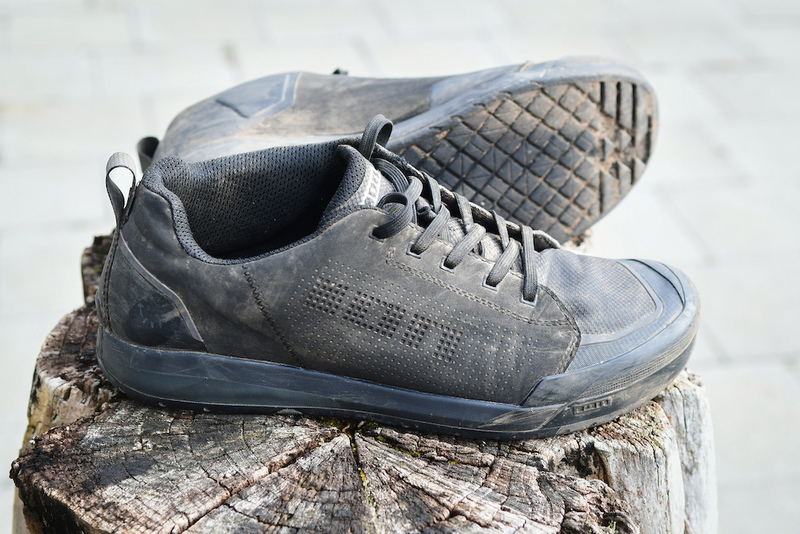 Ion released the original Raid Amp flat pedal shoe a few seasons ago, and while they were light and comfortable, there was one problem – the soles just weren’t sticky enough. Time to go back to the drawing board. 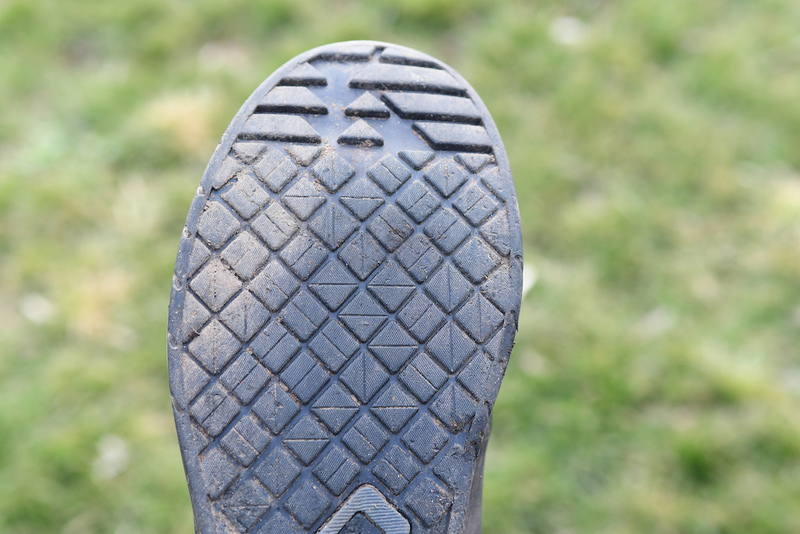 The latest version is called the Raid Amp II, and uses a new rubber compound and a softer midsole that’s designed to allow the shoes to really latch on to the pins of a flat pedal. The shoes still have the same look and basic design elements of the original – the uppers are ventilated and designed to be quick drying, and the asymmetric cuff provides a little extra ankle protection. 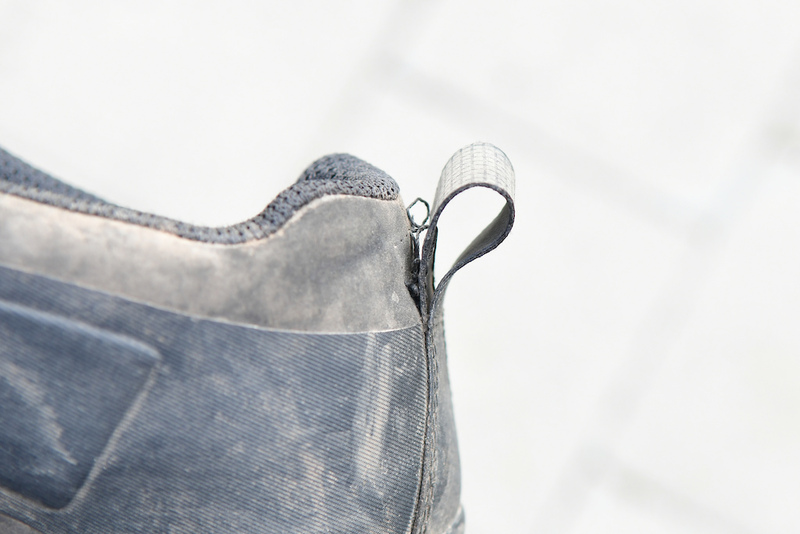 There’s also a molded rubber toecap to help prevent a rider’s toes from getting bruised and battered. The tongue isn’t gusseted, but there is an elastic strap sewn into the middle that helps keep the laces tucked out of the way. The Raid Amp II shoes are available in sizes 37-47, with three different color options: black, grey, or pink. Ion call their new sole design ‘Pin Tonic’. Good news – the Raid Amp II shoes are actually grippy, and not in the usual “almost like a 5.10, but not quite” way. In fact, I’d put the stickiness level right on par with that of 5.10’s S1 rubber, the stuff that’s used on their Freerider Pro shoes. I’ve used the Raid Amp II’s on a very wide range of pedals – Shimano XT, Anvl Tilt, Kona Wah Wah, Burgtec Mk4 Composite, and found that there was plenty of traction in every instance. The shoes are stiff and supportive enough to wear on long rides without needing to worry about foot pain, but there’s still enough flex to make walking around off the bike feel very natural. 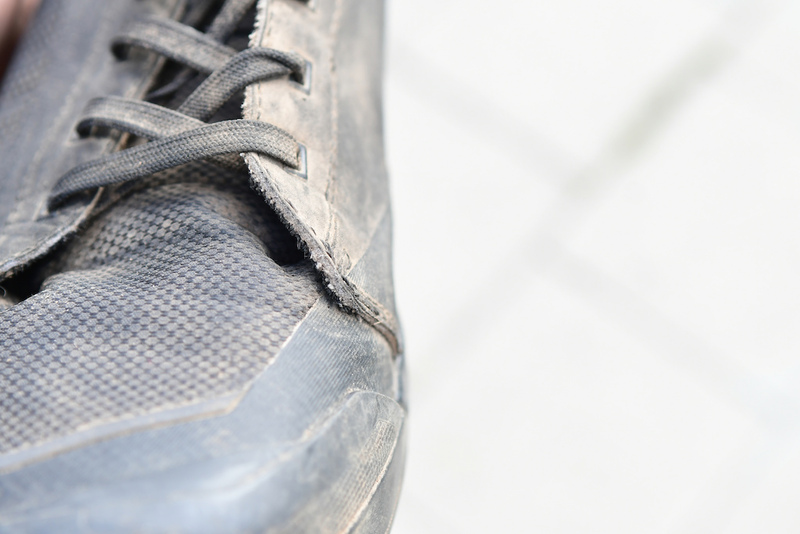 The shoes have a snug, foot-hugging fit, closer to what you’d expect from a pair of well-broken-in climbing shoes as opposed to a super-roomy skate shoe. That means these may not be the best option for riders with wide feet, but it does give them a very high degree of sensitivity, which makes it easy to tell exactly where your foot is on the pedal. How precise a shoe feels isn’t something that’s discussed very much, but it makes a difference when it comes to making those foot position micro-adjustments that flat pedal riding often requires. The Raid Amp II’s aren’t going to keep your feet from getting soaked in a rainstorm, but they don’t turn into lead weights once they’re fully saturated either. The upper material doesn’t retain much water, and it didn’t take long to get them dry and ready for another dousing after wet rides. I haven’t tested them in any really scorching temperatures, but they do seem to breathe well, and the lack of any extra-thick padding in the uppers should help prevent any overheated feet once summer time arrives. The soles of the shoes have held up very well over the last few months of use, without any unexpected wear or delamination, but I did run into some stitching related issues with the uppers. The stitching that holds one of the pull-straps on has begun to come apart, and while the last few stitches are holding strong, I’m not sure how long that will last. Some of the stitching just past where the front of the laces end has begun to give up as well, which is a little more worrying than losing the use of a pull-strap. Beantown really runs on Dunkin’. Dunkin’ and the sneaker manufacturer Saucony, both Massachusetts-based companies, paired up for the second year in row to create a custom shoe design in time for the Boston Marathon. Lacing up for the Boston Marathon should be a treat in the new limited edition Saucony x Dunkin’ Kinvara 10 athletic shoes, complete with strawberry-frosted doughnut medallions on the shoestrings, a Dunkin’ coffee cup on the tongue and the word “Boston” on a reflective strip on the heel. This year, the sweet kicks come in smaller sizes, too, for munchkins watching the April 15 race. “Marathons bring out the best of the human spirit, and the collective good that surrounds our hometown race is remarkable, inspirational and contagious,” Saucony chief marketing officer Don Lane told Boston.com. “We’re proud to partner with fellow Boston brand icon Dunkin’ in the creation of the Saucony x Dunkin’ Kinvara 10 to deliver even more goodness to our running community,” said Lane. Saucony, which also designed shoes after other Boston icons like the Freedom Trail and the Green Line, gave new meaning to the “America Runs on Dunkin’” slogan in its 2018 launch of the Kinvara 9 that featured a strawberry-frosted donut on the heel of each shoe. The orange and magenta innovation sold out in record timing, Saucony said in a statement. The 2019 shoe collaboration features sneakers for children, as well, offering smaller sizes from kids 10.5 to adult size 6 priced at $65 a pair. The two Boston brands joined forces to offer the identical design in a kid-friendly fit sneakers with a 3D-contoured memory foam footbed, triflex rubberized lugs on the sole for enhanced grip and an antimicrobial treatment in the lining to prevent smelly feet. A pair will run $120 for adult sizes and $65 for children sizes. The 2019 limited edition shoes went on sale Thursday at saucony.com and Marathon Sports in Boston, and on Friday at Marathon Sports in Brookline, Cambridge and Wellesley and on marathonsports.com. The shoes can also be purchased at the John Hancock Sports & Fitness Expo at the John B. Hynes Veterans Memorial Convention Center in Boston from April 12 to April 14. Dunkin’ and Saucony will also co-host several events leading up to the marathon, starting with a launch party on March 21 where free coffee will be served. Dunkin’ employees will also cheer on runners on marathon day and serve free coffee and doughnuts at a Saucony medal-engraving event at Marathon Sports’ Boylston Street location the day after the race. 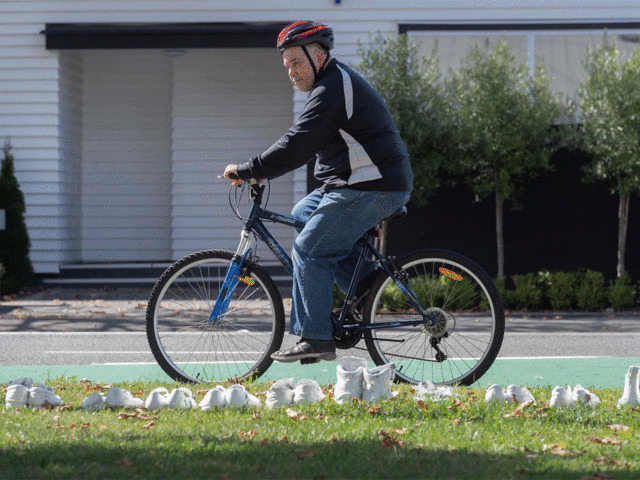 Fifty pairs of white shoes sit outside a church in Christchurch as a solemn symbol of the lives lost in the city. 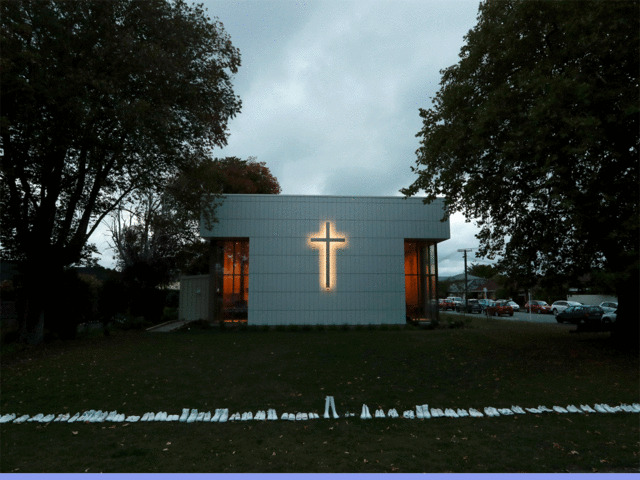 The move comes as churches all over Christchurch used their weekend services to express their horror at the massacre that killed 50 people and injured about 45 at two mosques in the city on Friday. A campaign titled “give nothing to hate” has also been created to encourage people to wear green hearts to express their solidarity with Muslims. Merivale’s All Souls Church vicar Megan Herles-Mooar said there was a desire from the congregation to respond to the tragedy. 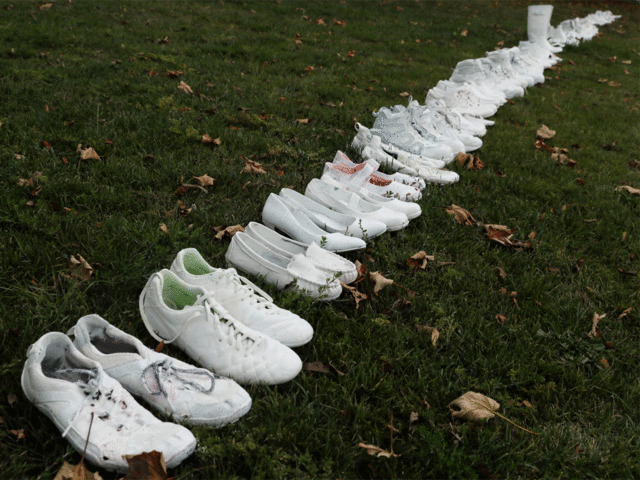 The congregation decided a pair of shoes to represent each person who died as a tangible way to express the loss. 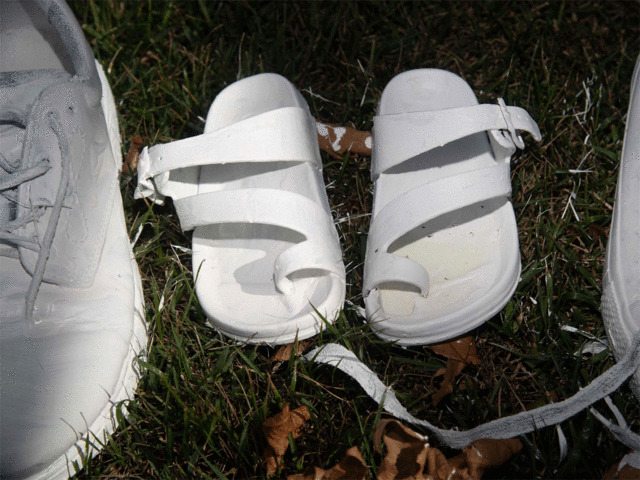 The church asked for donations of shoes and then painted them white. They were unsure how long the display would remain. The church has people supporting the families in every way they could. 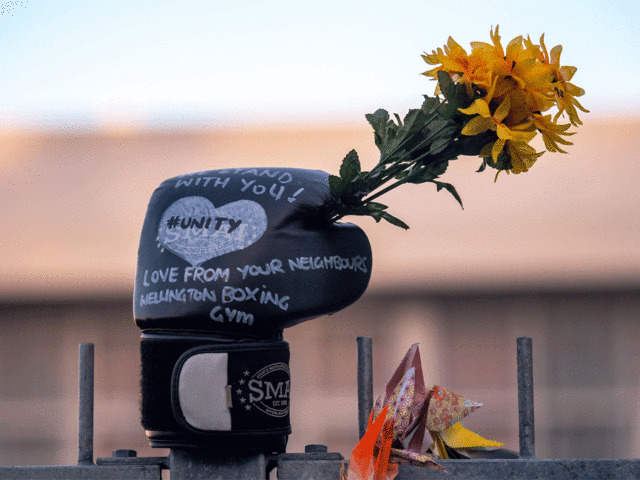 A public meeting would be held on Tuesday at the Transitional Cathedral in Latimer Square at 7 pm for the public to say how they want to respond to the massacre. The meeting, organised by the Canterbury Progressive Network, and EcuAction, a Canterbury based Interfaith network, would discuss a number of topics including how widespread white supremacist views were in Canterbury, gun control laws and whether religion was a unifying or dividing force in society. 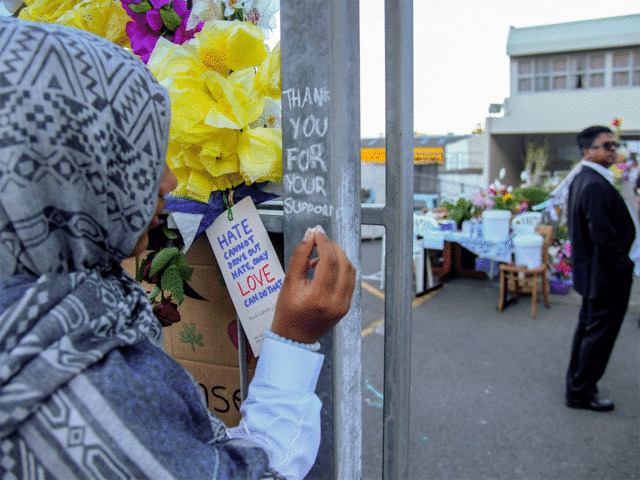 In pic – A Muslim girl writes a message to pay tribute to victims of the Christchurch mosque attacks.